DC Comics Final Night mini-series was published in 1996--which killed off Hal Jordan (as Parallax) in the concluding chapter. As we all know, Hal Jordan never left the DC Universe, he was always around as the Spectre until Green Lantern: Rebirth. As a memorial tribute to the hero they maligned, DC published a special "Green Lantern Gallery", loaded with pin-ups of the Silver Age Green Lantern. This cover jam was a real treat, featuring three generations of Green Lanterns, drawn by the artists who created them! 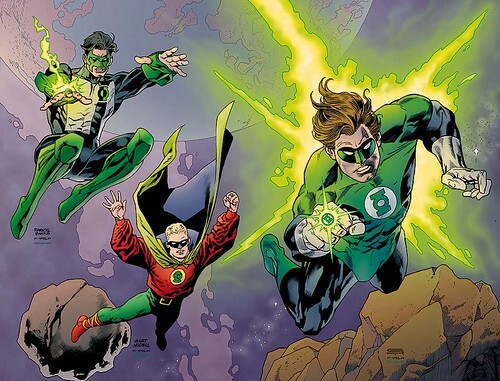 Gil Kane on Hal Jordan, Marty Nodell on Alan Scott, and Daryl Banks on Kyle Rayner. All of them topped off with inks by the great Kevin Nowlan. What a cover, whoever owns this one is very lucky! Nuff said.